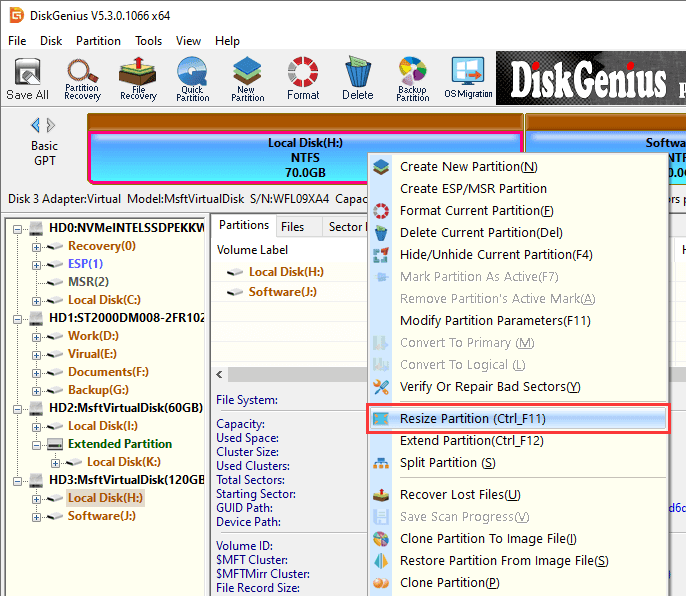 DiskGenius is able to change the size of partition without data loss, and you can use it to extend, shrink or split partition as you like. Step 2 Now the Resize Partition window pops up and you can set partition size here. Click Start button after setting partition size. Place mouse pointer on the edge of partition and you can drag it to change partition size; also, you can enter exact number in the column below. The disk space resized from the partition can be merged to other partition, kept unallocated or created new partition. Step 3 DiskGenius prompts operations to be done in following message box. Click Yes to continue. Step 4 Click Complete button when the programs finishes resizing partition. If the partition resizing process involves operating system, DiskGenius will prompts to enter DOS version to complete the task. If your operating system does not support DOS system anymore, you can enter DiskGenius WinPE version to resize system partition. Please do not access the partition being resized in case of any unexpected issues. The resizing process may take long time if there are too many files on the partition. In that case, you can set operations after resizing finishes. Partition resizing may fail to complete or even cause data loss due to hard drive or partition errors, bad sectors, sudden power failure or system errors. Thus resizing partition is a risky action to some extent and data backup is necessary.